Anne Innis Dagg is one of over 20 female scientists profiled in a new exhibit at the Canadian Museum of Nature in Ottawa. Courage and Passion: Canadian Women in Natural Sciences runs until March 31, 2019. The exhibition celebrates Canadian women who broke barriers to pursue their passion for science. Among those featured are field and mapping pioneer Alison Wilson; engineer and astronaut Julie Payette, now Governor General of Canada; and marine biologist Kathy Conlan. In addition to celebrating their scientific achievements, the exhibition also draws attention to the gender-based policies women had to overcome to succeed professionally. Visitors can see a number of artifacts, including a 16-foot-tall giraffe skeleton which towers over a description of Anne’s work. 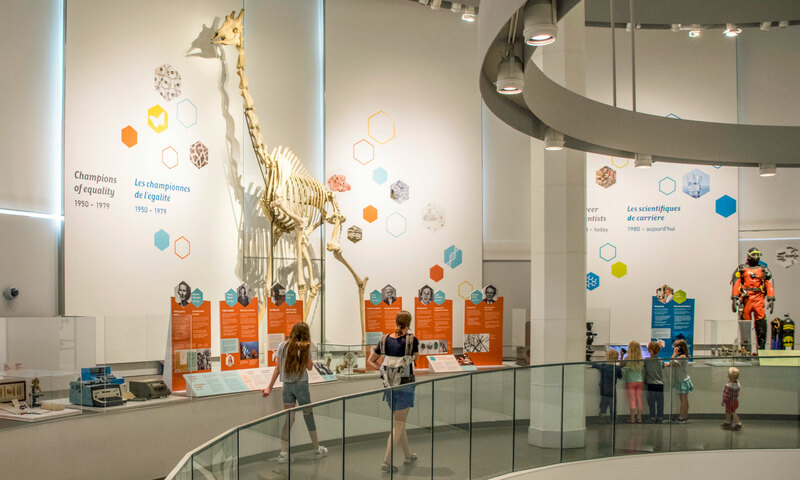 “[Anne] was one of the first western scientists to go to South Africa and do research on giraffes in their natural habitats,” said Cindy Stelmackowich, the exhibition’s curator and a professor with Carleton University’s gender studies department. The Anne Innis Dagg display at the Canadian Museum of Nature also features a short three minute video that includes 16mm archival film of 23-year-old Anne shot in 1956-57 while she was in South Africa conducting some of the first research on giraffe. The Woman Who Loves Giraffes, a documentary portrait of Anne Innis Dagg, opens the 2018/19 season of Doc Soup on Wednesday, October 3, 2018. To buy your tickets visit the Hot Docs Ted Rogers Cinema website.